While the skin is the largest organ outside your body, your liver is the largest organ inside your body. The liver is responsible for helping to store vitamins and minerals in your body and also to detoxify extra chemicals in your body. Taking excess amounts of certain supplement types can potentially damage your liver, which can affect your body's ability to detoxify your bloodstream. 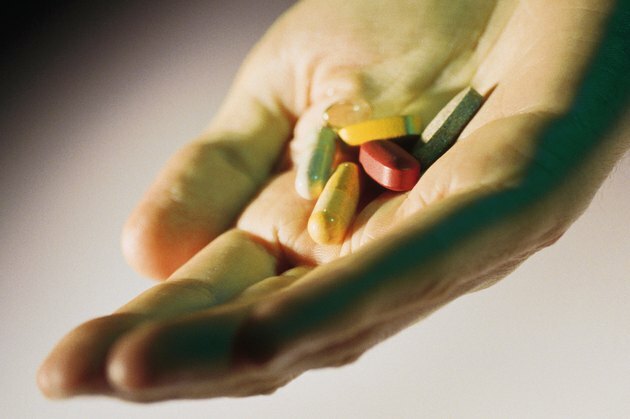 Fat-soluble vitamin supplements are those that can potentially be hazardous to your liver. This is because these vitamins are stored in the body while excess amounts of water-soluble vitamins are eliminated via your urine. Because the liver can store excess amounts of these vitamins, you typically need smaller amounts of fat-soluble vitamins than water-soluble vitamins. Taking excess amounts of vitamin A, known also as retinol, can be highly toxic to your liver and lead to liver damage, according to Hepatitis Foundation International. Taking more than 3,000 micrograms of retinol activitiy equivalents, or RAE, of vitamin A per day is associated with liver toxicities. Signs you are experiencing liver damage from high vitamin A dosages include dry skin, dizziness, blurred vision, headache, nausea and appetite loss. Discontinue or reduce your vitamin A supplement if you experience these symptoms. Another potentially toxic fat-soluble vitamin supplement is vitamin D. While vitamin D normally works to introduce calcium into your bones, excess amounts of the vitamin can cause liver damage. Toxicity can occur in adults within a few months of taking 1,250 micrograms or more daily. Symptoms associated with excess vitamin D supplementation include nausea, weight loss and irritability. These symptoms can give way to more serious symptoms, such as mental and physical growth retardation and kidney and liver damage. Reduce your dosage or refrain from taking vitamin D supplements if you experience these symptoms. Use extreme caution when taking diet pills that the U.S. Food & Drug Administration has not approved. From 2000 to 2002, seven women in China, Singapore and Japan died due to toxic effects to the liver of appetite-suppressing supplements, according to "Time" magazine. These supplements contained the compound N-nitroso fenfluramine, which has been associated with causing liver failure. In the U.S., this compound was banned in 1997 as an agent of heart-valve damage. To protect your liver and other organs from such deadly effects, read the labels of diet supplements carefully, looking for ingredients with the FDA seal of approval as well as reading for any warnings concerning potential toxic effects. Only get supplements from reputable sources. And remember that just because a drug is labeled "all-natural" does not mean it will not harm your liver, heart or other organs.